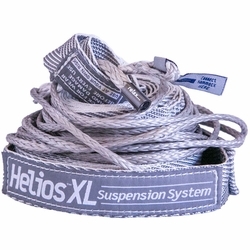 ENO Helios XL Suspension Straps System. Helios, Titan god of the sun, was light, strong and powerful - just like our Helios XL Suspension System. Measuring over 13 feet and able to accommodate even the most awkward of spacing, this techy, tree-friendly strap breaks legendary boundaries for hammockers. Eagles Nest Outfitters. Packed Dimensions	(L x W) 3" x 4"